If you head north on the SS131 out of Cagliari, you’ll be amazed at the landscape. There’s not much worth seeing in the blur that’s passing outside your window. The Campidano plain, a malarial swamp in between Roman times and the post-war period, is now a mostly agricultural area with industry shoved to the side of the SS road so that your weary eyes can enjoy the clap-trap beauty of rusty modernity. Then comes a little exit off the road that you might miss if you weren’t looking for it. 4 km southeast of the town of Paulilatino signs direct you to an exit marked Santa Cristina. Take it. It leads you to a parking lot of one of the world’s most fascinating off-ramp attractions. After just a bit of walking you’ll have seen a wide range of human history, from 1200-1600 years bce to the namesake church built in the 1200s and little pilgrim houses dating to the 1700s. 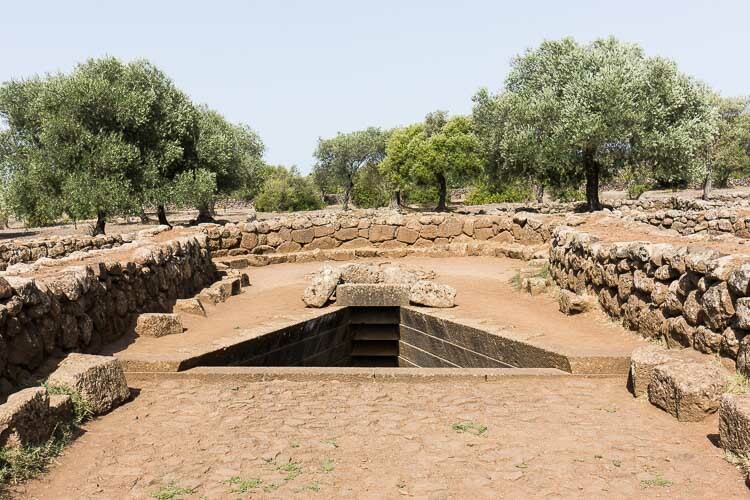 A sacred well, a tower nuraghe, little houses for pilgrims used on saint’s days, a souvenir shop/ticket office with decent crafts for sale, a modern bar with shaded outdoor terrace, a decent restaurant, and a well-groomed wooded area providing welcome shade round out the picture. The sacred well at Santa Cristina is the thing everyone comes to see. You can go through the bar, exit left and walk down a paved street to the trail. 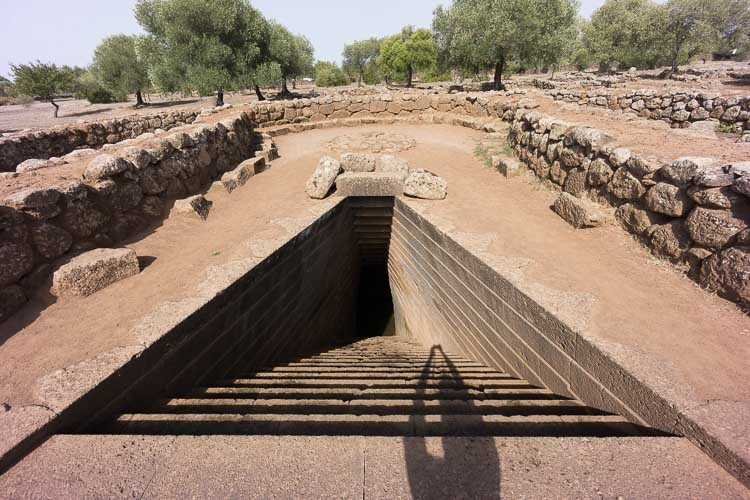 Archaeologists have settled upon a date of construction for the sacred well to around 1100-1200 years before Christ. Today it consists of steps down to a spring-fed, shallow well, which is covered by a cupola. 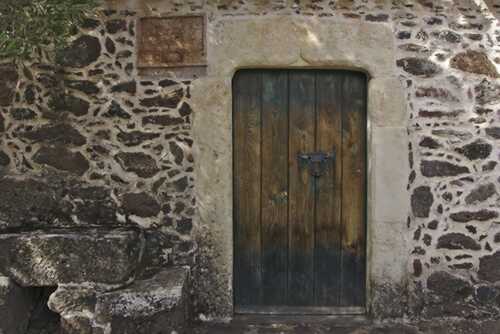 In the past it had a temple on top, as evidenced by the keyhole-shaped stone wall around it and other examples of sacred wells on the island. The basalt stones are very finely worked. Head straight out the bar terrace and you’ll be in the center of the “modern” Christian complex with small habitations (called Muristenes o Cumbessias) used by the faithful during the saint’s day on the second Sunday in May and for Archangel Gabriel celebration on the forth Sunday in October. these houses sit on the edges of a fine piazza. The plaque on the house in the picture is dated 1730. 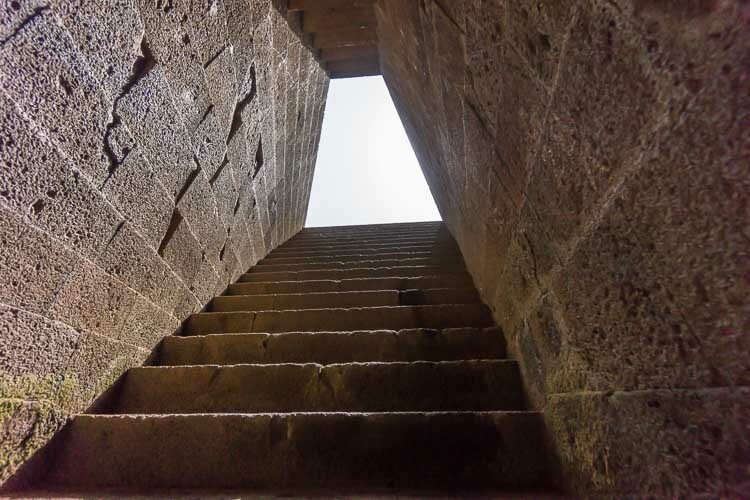 What remains of the nuraghe stand 6 metres high, with a short entrance corridor that leads into the main circular chamber with domed roof (tholos), which opens onto three smaller niche chambers. Surrounding the nuraghe are the remains of an extensive village. 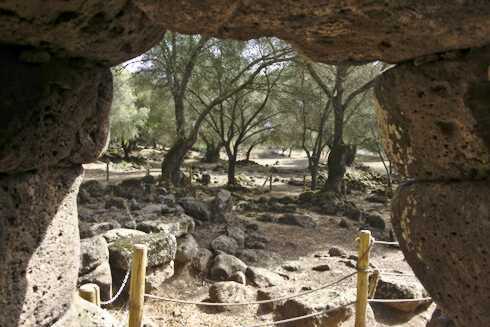 Behind the nuraghe is a long “barn” or hut. The bar offers snacks, drinks, and a view. The restaurant is quite good and reasonably priced, and offers “piattone”, a one plate special with all the trimmings if you don’t want a full Italian meal.